"spent our time till past twelve o’clock,"
Pepys seems to be quite the night owl. I'd have thought that there wasn't such a thing till the advent of better lighting. Must be near his solstice so there isn't much of a day either. Forced to spend the night at Creed's because of the time (no links) or by choice? "must be near his solstice"
methinks 10 days past the solstice;he was on the Julian Calendar. "One of his Majesty's chaplains preached; after which, instead of the ancient, grave, and solemn wind music accompanying the organ, was introduced a concert of twenty-four violins between every pause, after the French fantastical light way, better suiting a tavern, or playhouse, than a church. This was the first time of change, and now we no more heard the cornet which gave life to the organ; that instrument quite left off in which the English were so skilful. I dined at Mr. Povey's, where I talked with Cromer, a great musician." "Lord Chandois" : Who is this fellow? We have many streets named "Chandos" here in Sydney, Aust. - could they have been named after he? This one is presumably the 7th Baron. There's lots of Chandos placenames in London too, but I guess they're more likely to be named after the wealthy 9th Baron / 1st Duke. morn? 11am? the cows came home? Beth woke me up? "Beth woke me up?" - well Andy that isn't the case 'coz he slept at Creed's lodgings. I wonder why the diary entry trails off at this moment - maybe the imaginative Robert Gertz could give us a little script ... Go Robert! Andy/Miss Ann.... he obviously just fell asleep....zzzzzzzzzzzzz.! "Boring..." Shaken hair spilling about his precious pages as Bess clambers over him. "Bess, will you stop? Diary entry here." "Are you telling me the truth? That's all that happened last night?" "I'm writing it as I speak. Would I waste diary pages?" "Still don't see what the big future gain is in hanging round Creed all the time." "Connections, Bess...Connections. The way to early retirement and me getting to call you, your Ladyship, girl." As on previous occasions, Sam is writing up his dairy some days later and has written the events of 21 and 22 December at the same time. Our editor has kindly split the two days up for us. We'll get the rest tonight. I note "give over" again and wonder if Sam doesn't revert to a country sort of speech in this. "Give over" isn't "country," it's perfectly normal English. Phil: The family name of the Barons of Chandos (pronounced SHAN-doss, for those who don't know) is misspelled Bridges in the background entry; it should be Brydges. One of them was Georg Friederich Haendel's Patron. A record label for classical music was called after the Chandos Estate, (perhaps that has to do with A. de Araujo's note) indeed: "Chandos". 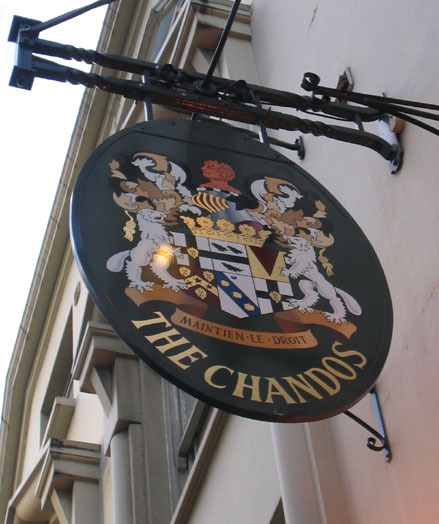 The only Inn that I have been to in cental London is "The Chandos", with a magnificent coat of arms as an Inn Sign. "By and by comes in my simple Lord Chandois..."
"...who began to sing psalms, but so dully that I was weary of it..."
Yet somehow it proves to be a musical family in the long run. Simple, maybe not ostentatious,or even pompass [pompous], not laudatious even tho he giving forth on some Psalms. Though it may have a bit of an old-fashioned tinge, I have encountered "give over" in American lyric poetry of the '20s and '30s, and it sounds to my ear more cosmopolitan than countrified. Of course nowadays you might just say, "Give it up, dude!" I think "simple" here means very plain and straightforward - possibly connotations of Puritanism (the nasal whine of psalm singing?). I know "fell to" is probably just a synonym for "ate" but it conjures up pictures to me of the three of them gobbling it up like hungry schoolboys, praising Mrs Sarah's cooking through mouthfuls of pastry. I thought "simple" here meant dull, stupid, simple-minded. c.1220, "humble, ignorant," from O.Fr. simple, from L. simplus "single," [...] Sense evolved to "lowly, common" (c.1280), then "mere, pure" (1303). As opposite of composite it dates from 1425; as opposite of complicated it dates from c.1555. Disparaging sense (1340) is from notion of "devoid of duplicity." Simply (adv.) in purely intensive sense is attested from 1590. 1374, from O.Fr. simplicite (Fr. simplicité), from L. simplicitatem (nom. simplicitas) "state of being simple," from simplex (gen. simplicis) "simple" (see simplex). Sense of "ignorance" is from 1514, that of "plainness" is from 1526. It seems that both meaning ("ignorant" and "plain") are possible. Language Hat? I. 1. Free from duplicity, dissimulation, or guile; innocent and harmless; undesigning, honest, open, straightforward. 1669 The Lord Cobham, a simple passionate man, but of very noble birth and great possessions. 2. Free from, devoid of, pride, ostentation, or display; humble, unpretentious. 1630 A third sort of Iesuites there are, not vnfitly termed simple ones; these are wonderfull austere in their life. II. 4. a. Of persons, or their origin: Poor or humble in condition; of low rank or position; undistinguished, mean, common. 6. a. Of persons or their attire: Not marked by any elegance or grandeur; very plain or homely. 9. Deficient in knowledge or learning; characterized by a certain lack of acuteness or quick apprehension. 1640 It is a Book for the simpler and ignorant People. 10. a. Lacking in ordinary sense or intelligence; more or less foolish, silly, or stupid; also, mentally deficient, half-witted. 1653 Unwary fools and defenselesse people were called simple. We really can't know which shade of meaning Pepys intended here. My money's on "Not marked by any elegance or grandeur; very plain or homely." It's likely that if Chandois is singing dull, boring psalms, he's also wearing dull, boring clothes. So I imagine that "simple" probably describes the way he dresses. "and advised him to give it quite over"
SP uses the phrase "give over" (but never "give off") many times in the Diary. To give over, as give off, I give it over for lost. SIMPLE, pure, unmix’d, Uncompounded, plain, void of Ornament; also downright, void of Deceit, Harmless; also Silly or Foolish. "I and Mr. Creed and Captain Ferrers fell to a cold goose pye of Mrs. Sarah’s"
To make a Goose Pye. HALF a peck of flour will make the Walls of a goose pye. Raise your crust just big enough to hold a large goose; first have a pickled dried tongue boiled tender enough to peel, cut off the root, bone a goose and a large fowl : take half a quarter of an ounce of mace beat fine, a large tea-spoonful of beaten pepper, three tea-spoonfuls of salt; mix all together, season your fowl and goose with it, then lay the fowl in the goose, and the tongue in the fowl, and the goose in the same form as if whole. Put half a pound of butter on the top, and lay on the lid. This pye is delicious, either hot or cold, and will keep a great while. A slice of this pye cut down across makes a pretty little side-dish for supper. ---The Complete Housewife. E. Smith, 1766. ‘simple, adj. and n. < Old French simple . . A. adj. In early examples it is often difficult to decide in which of several possible senses the word is to be taken. William is described by DNB as a 'dull and pious' parliamentarian - 'right but revolting' as '1066 and All That' has it.